Hundreds of thousands of scientists and their supporters recently took to the streets, marching in favor of science-based policies. How did our science-denying president respond? With one of the biggest lies he’s told to date — and that’s saying something. Is he joking? No seriously, I’m really asking. Did he have to hurry away from the press to hide the laugh he was bursting to contain after that whopper came out of his mouth? He put Myron Ebell — described by Business Insider as “a man who denies basic science” — in charge of his Environmental Protection Agency transition team. Ebell’s qualifications? He worked at an ideological libertarian think tank. He has no science background. This administration also rejected the recommendations of government scientists and chose to allow farmers to continue using a toxic pesticide known to harm children. 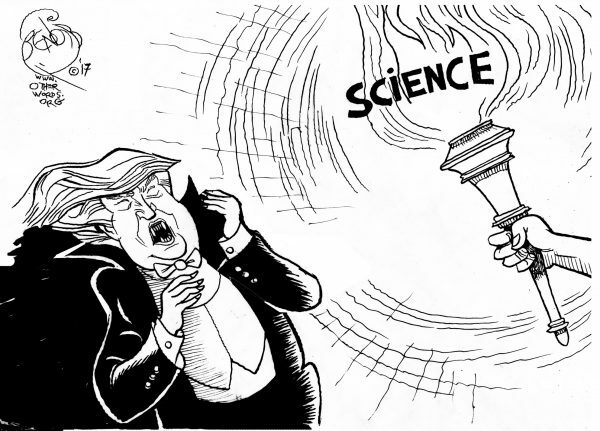 Meanwhile Trump is trying to cut scores of science programs, many of them related to Earth science and climate science. These cuts won’t just harm conservation, regulation, and other goals Trump doesn’t like but are necessary if we want to continue living on a hospitable planet. The cuts also eliminate thousands of government jobs directly, and cut programs that help Americans create jobs and stay competitive in the global market. No wonder scientists felt compelled to leave their labs and computers and march in the streets in perhaps the first mass demonstration by scientists in modern history. As a social scientist myself, I know what goes into a scientist’s quest for knowledge and truth. In each step of the process, a scientist must examine their own results and seek critique from peers, and ask whether our fallible human brains have somehow made an error in uncovering the truth of the world we live in. Those of us who do this for a career are serious about our endeavors. It takes a lot of humility, because we must always be prepared to admit when we’re wrong for the sake of uncovering the most accurate results possible. Most of us do our work because we love it, but also because we feel passionately that we’re making our world a better place — whether we’re working on new cures for fatal diseases or attempting to find a more sustainable and clean form of energy. It’s heart-wrenching to see an administration reject this work we’ve devoted our lives to simply to score political points, especially when we know what humanity stands to lose by ignoring science. Trump, for example, might do well to trust the climate scientists who are predicting sea level rise before he finds his precious Mar-a-Lago under water. But instead he turns a blind eye, enacts destructive policies that ignore science, and then gaslights the entire nation with a joke of a statement about his own purported belief in rigorous science.